Side by side Babillard dark and light. Thanks Dunt and Stakem. Mahogany body with a thin khaki collar. Sweet fruit, Apple juice, alcohol, funk, basement, musty. Spicy, breads, malty. Unique and intriguing. Back to adding reviews from Fantomefest 2014. Purchased this bottle alongside an ’03 Pissenlit at a Skinner Auction. 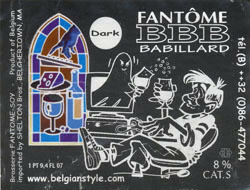 Poured into a Fantome tulip. Poured a murky brown in color with a small cocoa colored head that slowly dissipates to a ring of soapy bubbles around the glass. Nose and taste are earthy, malty, and have a slight coppery taste on the finish. Light mouthfeel with gentle carbonation and a moderate finish. Very nice dark saison, much better than I anticipated based on recent reviews of it here. Bottle, 07/15/2013. Here we go. Pours deep mahogany, medium fuzzy off-white head fades rather quickly, very thin lacing around the glass. Aroma is tart cherries, earthy must, light chocolate, yet dominated by vinegar, nail polish remover. Taste is a slightly more manageable with tart fruity vinegar, watery cola, earthy chartreuse-like spices, dry finish with light roast. Thin body. Well, not especially pleasant at this point, hopefully there are some better bottles out there. Here it is, a review of Saison that is likely far past it’s prime but then again seems to have taken on a far different character through the funky yeast overtones... meaning that this brew is FAR different that what is was when first released. The nose is a combination of earthy vapours, touch of dark malt sweetness and "urine" driven funky twang. (think the gutters of New Orleans Marti Gras here)... The taste is more of the complex strangeness, twangy and acidic as all get out but then there is a a chalky/ashy black patent malt character that makes this quite interesting. Not that I would say this "new" flavor profile is for everyone, but I sort of digging it has it warms. There is a LONG earthy tone upon the finish that is fully Saison in nature. Not any longer for the meek, only lovers of the style need apply to the BBB Dark Babillard. One of the most challenging brews I have had in while. Richmond Gathering. Capped and corked 750, courtesy of The_Beer_God. Clear brown with a beige head. Sweet nose with big funk! Funky cheese, nuts, roasty malt - wow! Really interesting. Becomes more sour as it warms, and a woodiness emerges. Flavor adds a medicinal note, but somehow it works really well with this brew. Excellent! Courtesy of The_Beer_God as part of the 6th Richmond Gathering. Clear deep copper color. Aroma of dark roasted malts,coffee, and almost cheesy yeast esters. Complicated flavor of roasted malts, oak, and earthy overtones. Light mouthfeel with a spicey earthy finish. very well carbonated. Thanks Beer God for sharing such a tasty and complex beer. Bottle - corked and capped. Dark brown body. Roasty, cheesy, nuttiness at first then yeast and "rotten funk". Taste is woody, funky, roasted malts, overripe fruit, herbal/medicinal notes/bitterness. Body is bubbly with some dry spots. Medium overall feel. Ends with more funky yeast, roasty notes, wood and cheese. After everyone got their share, the bottom, laced with sediment, was shaken and poured into my glass. With the sediment mixed it poured the color of chocolate milk, almost. Seemed much sweeter in the aroma as well. More carob bean and cocoa or chocolate. Taste seemed a touch sweeter as well. Almost a totally different beer! Courtesy of The_Beer_God as part of the 6th Richmond Gathering. Deep amber, clear, nice head. Nutty, earthy tartness in the aroma. Earth, roast, nuts, some woodiness but not oak. Very, very complex to say the least. There is a heck of a lot going on here. Complex aroma, woods, wet grass, slight chocolate. Nice brown body, malty, sweet taste with some grass and light peat. Smooth ending with a hint of smoke.